In this tutorial you are going to learn how to use a bill tracking application called “BillTracker” which will help you keep on top of your outgoing bills. First you are going to need to have the application installed, it can be found in the app store for free. When you first open the app you will be presented with this screen which allows you to add a bill, touch this button. As this is your first time using the app you will need to create an account for the bill to be associated with – enter all of the details required then touch “Save”. Now you will need to enter some additional information about the bill, touch “Payment Due”, enter the amount you will have to pay, then touch “New Bill” to return to the previous screen. Touch “Due Date” and then change the date that the bill has to be paid. 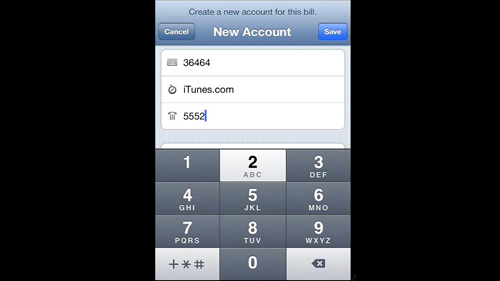 You can also touch the “Repeat Bill” option which can be useful for setting a monthly bill up. Here we are choosing to repeat the bill on a monthly basis. Touch “Save” in the top right corner to complete the process. 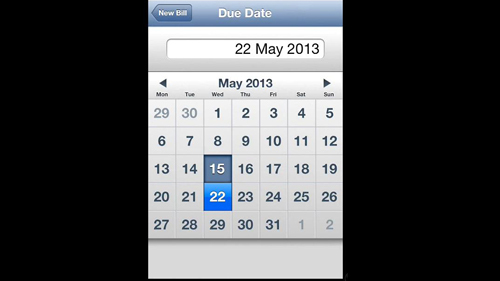 You can now see that the bill appears in a list of upcoming bills, you can see these in a calendar format by touching this button at the bottom. The “Accounts” area details any accounts that you have set up, and the “More” area allows you to adjust various settings (such as security) and purchase the full version of the app if you wish. 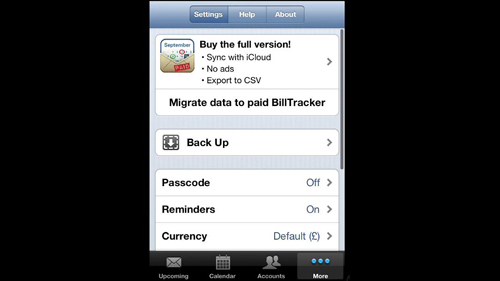 That is a quick introduction to bill tracking on an iPhone.